Congratulations, you’ve been awarded a new freight contract. But wait, a few surprises buried within the transportation RFP might make it difficult, if not impossible, for Operations to efficiently and profitably execute the business. Hopefully, this doesn’t sound familiar. But it does happen, especially as carriers struggle to keep up with the seemingly endless stream of RFPs received at the height of bid season. From the conversion of often-complex shipper spreadsheets and documents to time-intensive searches through tangled webs of historical files, the freight bidding process often involves too much administrative “heavy lifting” while offering too little time for thoughtful, careful analysis. Let’s say you’re on your eighth transportation RFP of the day – not an unlikely scenario this time of year – and find yourself combing through multiple tabs of randomly presented data. Your hope is that all of the information you’ll need will be found in this single file, but chances are you will have to invest hours in reviewing and organizing the information before you can determine what’s missing. Beyond origin, destination and annual volume, you’ll need to know commodity characteristics, whether it’s a live load versus a drop, customer delivery versus inter-company transfer, facility hours of operation, and dozens of other details in order to structure a competitive and profitable bid. Without this vital information, you might be pricing the business based on incorrect assumptions, or passing on an opportunity that is actually an ideal fit for your network. Burying yourself and your team members in this administrative heavy lifting is the wrong way to manage the freight bidding process. The smart approach is to automate as much of the administrative work as possible so your analysts can spend more time doing what they do best. TMW Systems has addressed this challenge with a powerful new, intelligent bid management software, Engage.Bid. This Web-based application enables carriers, brokers, and 3PLs to automate most of the administrative activity while providing fast, easy access to the critical market intelligence and historical data needed to price with clarity, conviction, and confidence. With Engage.Bid, the hour or more spent collecting and organizing information from each RFP can be compressed to five minutes or less, eliminating much of the stress associated with bid season. In addition to saving several hours of work each day, Engage.Bid surrounds the analyst with a carefully organized eco-system of relevant data and other information collected and normalized from shipper files and other sources. No longer is it necessary to toggle from spreadsheet to email to document to try to forecast how a piece of business will operate. The analyst can now structure each bid based on cold, hard facts rather than potentially risky assumptions. The benefits of this automated, data-driven approach become more valuable with each completed bid. The user’s research is automatically indexed within a searchable database for use in each succeeding round of pricing as well as future business opportunities. This data warehouse can also be an invaluable tool in strategically soliciting new business; a salesperson can simply query the data to find freight they are not already operating, then work in concert with an analyst to structure and submit an attractive bid. 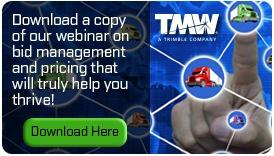 To learn more about automating the transportation RFP bidding process, call TMW at (440) 721-2806 or visit<a href="http://www.tmwsystems.com/engagebid-request-demo"> tmwsystems.com/engagebid-request-demo to request a free demo of our bid management software.